Before you read this story, take a look at that picture above. It depicts the surface of the comet 67P/Churyumov–Gerasimenko, and somewhere in it is hidden a washing-machine-sized spacecraft. Can you find it? The answer is at the bottom of the story. The machine's name is Philae, and it was an integral part of the 1.3 billion euro Rosetta mission, launched in 2004. The goal was to land a probe on the surface of a comet in an attempt to learn more about the origins of the solar system. After a ten-year, 6.5 billion-kilometre journey, the probe was dropped from its mothership Rosetta in November 2014. It was supposed to fire harpoons to lock it to the surface, but these failed to active and it bounced twice, coming to rest in a ditch somewhere - no-one knew exactly where. It managed to carry out 64 hours of experiments before its batteries failed, and just over a month ago the scientists responsible for the craft finally switched off the electronics used to communicate with it, tweeting a heartbreaking goodbye in the process. The mothership Rosetta continued its work, snapping photos and learning as much as it could from the comet's orbit. Now, just weeks before its own mission ends, it has finally located the lander. In a photo captured on 2 September, it spotted Philae in a gully at the bottom of a cliff, with its antennas pointed downward. "With only a month left of the Rosetta mission, we are so happy to have finally imaged Philae and to see it in such amazing detail," said Cecilia Tubiana, part of the camera team and the first person to see the images. 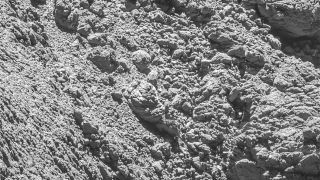 "This wonderful news means that we now have the missing 'ground-truth' information needed to put Philae's three days of science into proper context, now that we know where that ground actually is," added Rosetta project scientist Matt Taylor.